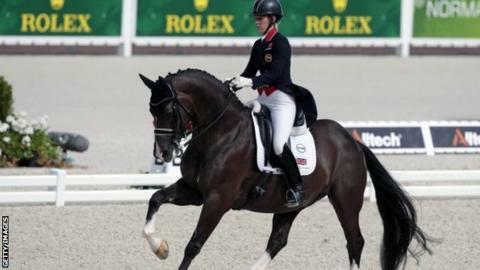 Double Olympic gold medallist Charlotte Dujardin will lead the four-strong British dressage team at next month's European Championships in Germany. Dujardin, 30, will ride her multiple medal-winning horse Valegro in Aachen. The world champion will be joined by fellow London 2012 team gold medallist Carl Hester, 48, on Nip Tuck, as well as Michael Eilberg on Marakov and Fiona Bigwood on Atterupgaards Orthilia. Britain won the European team title in 2011 but came third two years ago. Germany won that event, with the Netherlands in second place. Dujardin will defend her individual European titles as well as taking part in the team event. She said: "Valegro is in great form, as ever, and we are looking forward to defending our European titles." The FEI dressage event will run from 12-16 August. Hester said: "I feel like it's a really exciting time to be on the team. "All the horses seem to be on top form, and it's very exciting that we are heading into the championships to fight for a medal place."